For so many of the Spokane Indians, their pregame to-do lists include stopping by the first-base sidelines to grab a treat from a longtime fan. 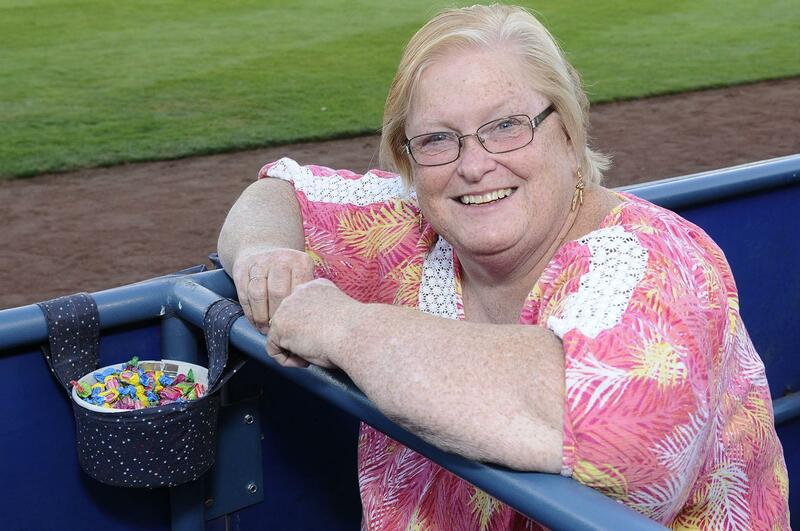 Every summer, when Avista Stadium brings in a new squad of Indians, the new players are quick to find Lynn Hicks sitting in her field-side seats with her bucket of bubble gum. Before the start of every home game, the Indians flock to Hicks. They catch up with her and tell her how they did on their recent road games, all while digging around in Hicks’ little bucket of gum that she hangs on the railing near her seat. The players always make sure to stick to their pregame rituals, right down to a specific number of pieces of gum that they’ll grab from Hicks’ bucket. “I always get three,” catcher Matt Whatley said while digging around in the bucket for his favorite flavors. But Hicks said it’s not always about the number of gum pieces the players will grab every home game, but about the flavors that make their mouths water. Hicks has been bringing bubble gum to the stadium since 1998, nearly a decade after she became an Indians season ticket holder. Hicks said the bubble gum idea started at home, when she would house players – such as former Oakland Athletics second baseman Mark Ellis, who played in Spokane in 1999 – in her home while they were in Spokane for the summer. Hicks would always buy the players who lived with her a small bag of gum for them to take to the ballpark. Hicks’ mother started coming with her to the games in the late 1990s. She suggested that they start bringing gum for all the players and coaching staff to enjoy. Hicks started buying much bigger bags of gum – 3-pound bags that she could only find at Costco. She turned to some online distributors a few years later after the store discontinued the large gum bags. Now Hicks buys tubs of gum online that weigh a little more than 5 pounds each and are packed with 380 pieces of flavored gum. Hicks will also bring small bags of regular bubble gum to the stadium for those such as Indians assistant coach Turtle Thomas, who only like the original flavor. “Turtle always gets regular. He doesn’t want anything else,” Hicks said. Hicks hasn’t added up all the gum she’s purchased this year, but last year’s total came in around $300 after purchasing 14 tubs of flavored gum and 75 pounds of regular. Hicks even helps the players get their fix on the road. She has donated a couple of tubs this season through the team’s booster club so that the Indians can get a handful of treats when they’re traveling to another stadium. The 67-year-old Hicks said that as long as she is able to get to the tadium, she will keep on the family tradition inspired by her mother, who died in 2012. Hicks’ mom left her with $500 in an account so that she would have enough funds to keep bringing the players their daily treats, and so Hicks could have a subtle reminder of her mom every time she set up her little bucket of gum before a game. Following their first five-game series sweep of the season against the Salem-Keizer Volcanoes, the Spokane Indians (21-14 second half) sits in first place of the Northwest League’s North Division second-half standings. The Indians are a game ahead of the Tri-City Dust Devils (20-15) heading into the teams’ final three-game series weekend. The Indians face the Everett AquaSox (18-17), beginning at 6:30 p.m. Friday. The Dust Devils will take on first-half champion Vancouver (19-16) at 7:15 p.m. The second-half champion will face Vancouver in a best-of-3, first-round playoff series beginning Tuesday. Vancouver has until Monday to decide to host Game 1 or to wait and host Games 2 and 3. The series winner will move onto the best-of-5 championship against the winner of the South Division. The South Division champ will host the first two games, starting Sept. 8. Published: Aug. 31, 2017, 7:18 p.m. Updated: Aug. 31, 2017, 10:50 p.m.